A tailcoat tuxedo is a tuxedo which has the coat with the front of the skirt cut away, so that it leaves only the rear section of the skirt which is known as the tails. These tailcoats can be either an evening coat or a morning coat and both of them differ in structure. 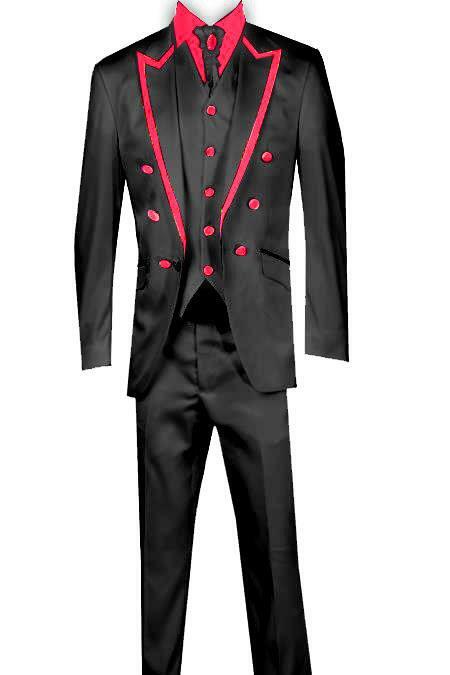 These tailcoat tuxedos have origins as informal wear that is donned while riding horses and so on. However, in the recent era they have evolved to become a unique piece of garment in the fashion world and are worn in cocktail parties, formal evening get together, formal dinners, fancy occasions, weddings and so on. They are occasion specific and shouldn't be worn to a random place at ease as that can look very odd. You can buy a readymade or a pre- made coat too but you must be absolutely sure that you have proportions virtually identical to the tailcoat to ensure the perfect fit. Ill- fitting tailcoats can be the worst things ever and therefore never mess up in the area of the fit. THE EVENING TAILCOAT – The evening tailcoat is a dark one with a sharply or squarely- cut away front, is double- breasted, has silk faced lapels and it is usually worn with a white tie. The evening tailcoat is further differentiated in that it must fit the torso snugly even though it is cut so that it cannot be closed or buttoned. Therefore they must be stitched so perfectly well that they wrap around the guy's body perfectly well. The tailcoat is usually waist length in the front and sides, and has two long tails reaching to the knees in back. Sometimes there is a pocket on the inside to hold gloves and other items. The recent evening tailcoats lack side pockets even though they used to possess them in the past. Although there are two rows of buttons on these coats, they are all non-functional and serve only a decorative function. This is because this coat isn't meant to fasten in the front despite being double breasted in structure. THE MORNING TAILCOAT – The morning tail coat, also known as a 'cutaway' in American English, is a single- breasted model, has self faced lapels and it is cut away at the front in a gradual taper. Their front parts usually meet at one button in the middle and they curve away gradually into a pair of tails behind. These tailcoats also have two ornamental buttons on the waist seam. The lapels are usually pointed or peaked and not stepped. This is because the coat is now only worn as formalwear and therefore peaked lapels are the most appropriate kinds. However, they used to posses the step lapel earlier since it was worn as half dress in those times. The morning tailcoat coat can be grey or black and is usually worn with striped or very occasionally checked trouser pants. They may also be worn as part of a morning suit, which is mid-grey with matching trousers and waistcoat. FIT – The full-dress tailcoat's design is very efficient at adding stature to shorter men because it has the ability to visually elevate the waistline. The tailcoat's waistline typically mirrors the wearer's natural waistline and fits around the waist snugly. Unlike the other jackets, the coat fronts end shortly below the waistline since they need to be curved into tails. Since the dividing line between the waistcoat and the black trousers appears to break the body into vertical halves, the raising of this line gives the impression of longer legs and a taller body. The division of the coat's skirt into two "tails" is done by a center vent which rises up to the waistline and this has originally inspired the nicknames of 'swallow-tail coat' and 'claw-hammer tailcoat'. The front of the coat should be kept opened, exposing considerable amount of shirt. There shouldn't be any crease discernible in the back or the tails. The coat's collar should fit snugly at the neck and rise just high enough to cover the shirt collar's rear and the bow tie's band. But a significant amount of the shirt should be visible. The lapels should roll a little below the top button of the waistcoat from where the line slants away to the edge which inclines slightly upward and rounds into the skirt. Tailcoats sleeves are also relatively narrow than the other suit jackets and are wide enough to allow the shirt cuff to slip through and be visible. The tails generally extend down to the bend of the knee in a straight line with a gentle curve at the bottom. Overall, it should be a snug fit which makes you look dapper and elegant. •	The trouser pants of the tailcoat tuxedos are constructed of the same fabric as the tailcoat. They come together as a piece of an ensemble and hence they tend to be well matched. •	The trouser pants differ from the pants of regular suits and tuxedos in the way that they must be cut with a high waistline. This is because it is essential that they sit just above the bottom of the coat's fronts and not reveal any navel or exposed skin. •	Another reason for the high cut pants is that it is also essential that they remain in place throughout various intense activities that you may go through, like ballroom dancing for example. To ensure this, men prefer to wear the pants with suspenders as that would allow them complete freedom to move about and not be conscious of their tuxedo. •	Black is the most preferred and the traditional color for a tuxedo as it conveys formality, grace and elegance. Therefore buy a tux in black as that alone can signify your dapper and can also be appropriate to all occasions. •	The only shoes that can be appropriate for tuxedos are classic oxfords as they are the most elegant and dressy shoes in the men's wardrobe. A well shined pair of black oxford shoes is what you need to go with this outfit. •	Wearing a white bow tie with the outfit is necessary as tuxedos demand bow ties as a part of the ensemble. Make sure that the bow tie isn't of the pre- tied or the clip on variety as those can look juvenile and they can ruin your image. •	Wearing any other accessories is not recommended, although going for a white pocket square is optional. Don't choose to go for any other colors or patterned pocket squares as that can ruin the formality.